Now that we're hitting triple-digits in most places around 'zona, here are some tips on dealing with sunburns. Sunblocks and lotions should be applied at least 20 minutes BEFORE going in the sun so it can be absorbed into skin layers, especially on your little ones! Use one with SPF 30 or higher and 3 or 4 star UVA protection. Remember... dark colors absorb heat so best to wear light or white colors to reflect sunlight. And you can get sunburned on cloudy days just as easily as sunny days - if you can see a shadow, you’re still catching some rays. • Cool the burn by using cool cloths or pure aloe vera gel. • Get out of sun or cover up to avoid further damage. • Take care of blisters by loosely covering them and don’t pick at them! 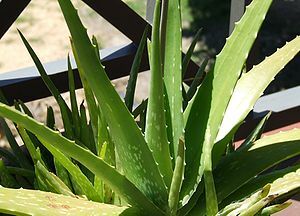 Aloe vera - Break open a fresh leaf or use 96-100% pure aloe gel. Baking soda - Add 1/2 cup baking soda to a warm bath and soak for half an hour. Vinegar - Put some regular or cider vinegar on a cloth and apply to sunburned area. Above extracted from IT'S A DISASTER!